Has it really been 14 years since the last novel by Annie Proulx? For me, any new book by Proulx is a treat but this new novel is something exceptional and meant to be savored. Barkskins is a multi-generational saga that follows the fortunes and misfortunes of two families over a period of three hundred years. Rene Sel and Charles Duquet are two poor, illiterate young Frenchmen who come to French Canada as indentured servants, bound to a feudal lord for three years in the hopes of receiving their own land in exchange. Their stories quickly diverge as Duquet runs off to make his fortune and his legacy and Sel remains to work the land. This is a big doorstop of a novel at 700+ pages. But by alternating between the stories of the two families, this book reads more quickly than its length would imply. Proulx takes her characters from French Canada to Europe, China, New Zealand, and across North America, wherever there are trees to be cut and money to be made The story of these two families is also the story of the use and abuse of natural resources, in this case, the forests of the New World by settlers from the Old and their descendants. The trees are seen as inexhaustible and there to be cleared for farmland or sold for profit. Along the way, the author takes us into the lives of the Native Americans and mixed-race inhabitants of the northeast and conveys her well researched knowledge of the forest trade and the men and women who worked in it and profited from it. If there's one shortcoming, it's that the final few chapters (taking us up to modern times) seem rushed but after 700 pages, it's hard to call anything "rushed". As with her other works, Proulx creates characters that are vivid, colorful and engaging and this is no small task in a novel of this length with its ever-growing cast of characters. For me however, it's her lyrical use of language that makes each new book from her something special. Oftentimes I'll find myself skimming over long descriptive passages when reading other authors. But with Annie Proulx, becoming immersed in her prose is a big part of the enjoyment. The description of a cold night in the woods becomes "The moon was a slice of white radish, the shadows of incomparable blackness. The shapes of trees fell sharply on the snow, of blackness so profound they seemed gashes into the underworld. The days were short and the setting sun was snarled in rags of flying storm cloud." If you've read Annie Proulx in the past, you know what a treat this book will be. If you haven't, then pick up this book and dive in. It's a rich experience just waiting for you to enjoy. Great book until the last segment which turns into a sermon on ecology and how greedy and terrible mankind has become. I believe we all need to do our part to save the seas, forests, an imal life, and all sustainable resourses, but another lecture in the form of literature was unexpected and unwarranted as it took away from tbe saga. Reading this book felt like a chore to me. The plot jumped from person to person with little character development. It was impossible to follow on ebook format without the geneaology chart. Overall, deeply unsatisfying! Barkskins rewards the determined reader. 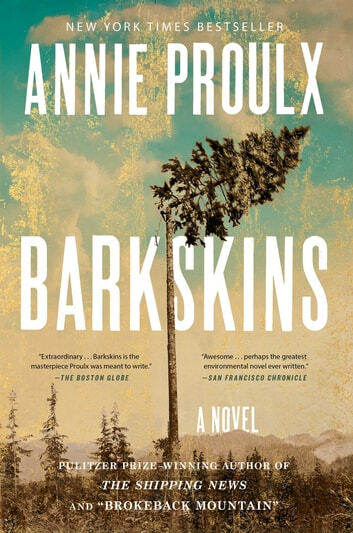 Wonderful writing from a masterful author; Annie Proulx is a living treasure. She already won a Pulitzer Prize for The Shipping News; I find myself wondering if she will win the Nobel Prize for Literature. I purchased the e-book and it was not until I read it that I discovered how very long a book Barkskins is. If I picked up a physical book of 736 pages I would quickly put it down. I recommend this book for avid readers who are not intimidated by its size. Barkskins is a monmental book that spans more than 360 years and sever generations of families. A masterful intertwining has occurred.